Visiting new places can be one of the most exciting and meaningful experiences of your life, because travel teaches you a great deal about yourself. But it can also be stressful when not planned properly. Since my wanderlust is never satisfied, I’ve been near and far. One thing that’s brought me peace of mind on each of these trips are the apps that can make travel easier. This way, you can focus on living it up wherever your destination may be. 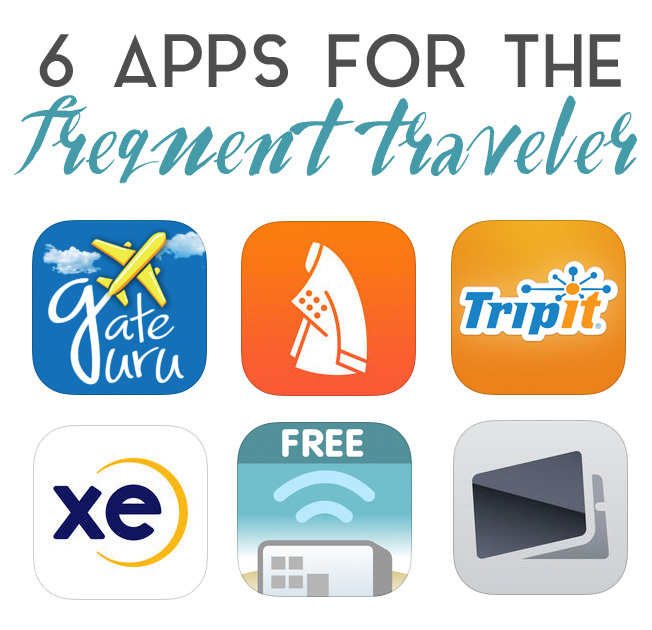 Below are 6 apps for the frequent traveler that will make planning and exploration a breeze. Gate Guru – Ever been stuck in an airport on a delayed layover? You might be hungry or want a good spot to hang out but aren’t familiar with the airport? Gate Guru provides detailed info, tips and maps on gates in airports all over the world. It also updates your flight info in real time so you can get a heads up about last minute gate changes. Chefsfeed – Yelp is handy for getting a sense of local flavors but can be a bit unwieldy if you are in a completely unfamiliar place. You might miss out on something really special because you don’t know where to look. Chefsfeed is a curated list of restaurants and local dishes recommended by notable chefs. For now the list includes major US and Canadian cities, plus London, but it is always growing to give more great grub tips. TripIt – Keeping track of all your flight info can be daunting. Your email probably will contain confirmations for multiple flights, hotels, car rentals, restaurant reservations, concert tickets, etc. TripIt brings some order to this chaos. By forwarding your emails to TripIt you can get a master itinerary for all your plans. Rather than digging through emails for all those items you can just check one place for everything. XE Currency – One crucial part of travel is having foreign currency because not everywhere takes credit. Currency rates are always in flux and many places are looking to take advantage by giving you subpar exchange rates. With XE Currency you can find out what the most current exchange rates actually are. This will help you make an educated decision on the rates offered by various currency exchange stores and banks, giving you more bang for your buck to stretch your souvenir buying and exploration. Free Wi-Fi Finder – We love our connection to the internet while at home but what are you supposed to do when you travel? The Free Wi-Fi Finder app uses your phone’s GPS to find nearby hotspots with free Wi-Fi. It’s wonderful to disconnect while on the road, but for those who still need the web, this could save you the headache of changing or using up your data plan and/or the trouble of swapping your sim card. Award Wallet – Getting points for travel is great but all those programs and emails from the companies can be a little unwieldy to keep track of. Enter Award Wallet. By entering your information you can easily keep track of all your different points in one place. This means it will be easier to remember to use those precious miles rather than losing them to corporate rollover trickery in your junk email! Is there an app you can’t live without when you travel?